Hmmm. It's one of those days. I have watched Explorer crash my computer 5 times this morning, and on several occasions gone off in a huff to pack the dishwasher, do two loads of laundry, fling some old clothes to Goodwill, water the garden and brush the cat. I also watered another cat, hidden behind a potplant, but I honestly didn't mean to do that. I will not be forgiven today. My computer needs to be revamped, and I just don't want to tackle it while I have so much work to do. However, the work would go more easily if the computer was running more efficiently. Do I meddle with it? Or just plod through the work, like walking in treacle, grimly putting up with the freezes and crashes and the dreaded bluescreen. I have ordered more memory, and I will reinstall Windows, but please, not n ow! I am also trying to take some photos for another online tutorial, but I keep getting interrupted at that too. But 5 minutes here and there will see it done. Is this a backing being prepared? More later. One problem of having a twin who thinks exactly as you do is that it's difficult to buy presents for each other. One year I bought Mereth a fantastic book for Christmas, that I knew she would love. 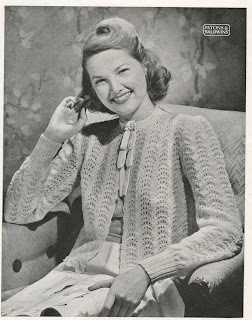 I couldn't resist gloating to her on the phone about how much she was going to enjoy her present from me. She assured me that I would love her gift more. This went on for a while, and we admitted to each other that both presents were books, then a horrid suspicion began to form. We both ran off and got our books, and I read out the f irst sentence, and they were the same book! So we saved on postage and wrapped them up and put them under our own Christmas tree. That has happened three times. 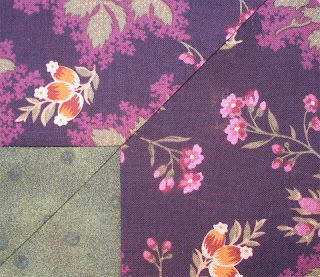 Just recently I saw a fantastic book on textile design on Fiona's blog, and promptly ordered it for myself on Amazon. When it arrived I rang Mereth and raved about it, saying she had to have her own copy. She was Furious with me! She had bought a second hand copy and it was waiting to be posted to me as a birthday present. Sheesh! Like I knew? So we each have our own copy, though hers is hard-cover and seeing she bought it for me as a present then maybe we could swap and she can have the soft-cover.... But that would be petty, wouldn't it? 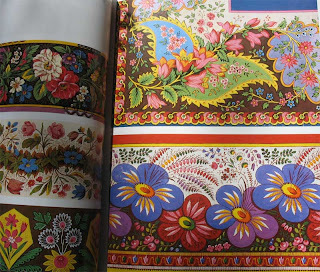 I adore this book; there is so much inspiration in it for designs and quilts and colour schemes. I do love my reference library. I almost never read fiction any more, except for Harry Potter and Tolkien. I love autobiographies, history and resource books that get me thinking along new lines. 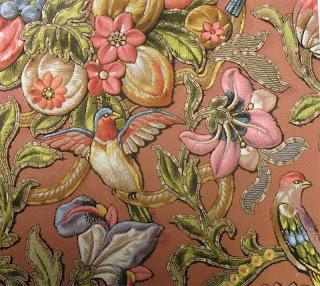 These birds would make lovely applique designs, and the colours are so rich and sumptuous. Things like this inspire me to look at my fabric stash with a new eye, and to combine colours in ways I wouldn't ordinarily do. One of Mereth's interest is ornithology, and bird illustration. How many of you have kept a dead Avocet in your freezer while you made proportionally correct sketches over several days? I know I haven't! Last week I found a lovely book on bird illustration and I bought it for her, but I made a point of telling her so she won't buy it for herself before I can post it to her. I have to go to the hairdresser soon, to get a cut and colour so I can look presentable at the Sydney quilt show next month. I have a dreadful time with hairsalons, as does Meggie. I have felt the depths of despair watching my hair being tarted around by well-meaning girls and boys, confident that they can be the ones to take control. But my hair is all passive resistance. Even as they stand back to survey their work it starts stubbornly curling back to wherever it wants to be. And that's not a good thing. "Have you tried 'product'?" one woman asked disbelievingly, unable to comprehend that my hair will not be controlled. But I don't have the time or lifestyle where I want to slather my head in 'product' and blowdry it into an edifice and then live in dread of rain or humidity. Not me. My last haircut, before my FIL's funeral, left me looking like a Viking warrior in a horned helmet. The hairdresser, having cut it so badly, only charged me $5. Amazingly, the day of the funeral it looked fine, but has misbehaved and given me demonic horns almost every day since. And now it has almost grown long enough to lie down flat, and I have to go back and get it cut again. 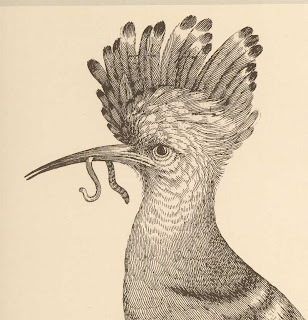 It's a Hoopoe, if you're interested. Looks like Mereth was spotted by fellow quilters and bloggers at the Perth Show. It's such a small world. Hi Nicola, hi Kathy! I needed a break from the computer, so I hopped in the ca r and drove a few miles out of town to a plant nursery. We have been going there for the last 22 years and it's hardly changed a bit. I love walking among the corridors of plants and dreaming of what I could do with a bigger block of land. 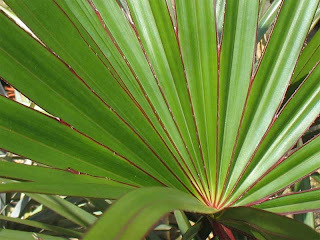 Palms. 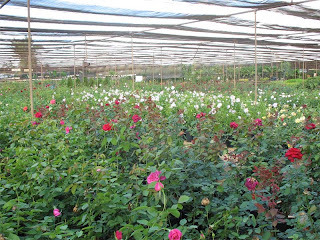 fruit trees, flowering shrubs, hibiscus, more herbs, and of course the roses! The air was heavy with their perfume, it was a lovely interlude. And I was sensible and bought nothing, but I truly hate being sensible sometimes. I think I'm going to go back and get myself a rose; it's less than the price of a bunch of flowers, and will give me a whole lot more pleasure as I watch it grow, even if I have to grow it in a pot. 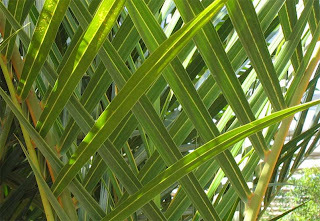 The palms make fascinating patterns of light and shade. 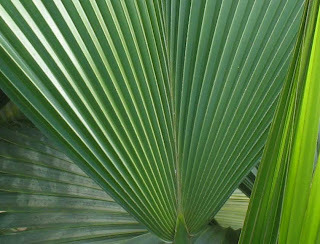 I loved the basket weave effect of the new fronds emerging. So much inspiration all around. I have a thing for Hawaii print fabric. 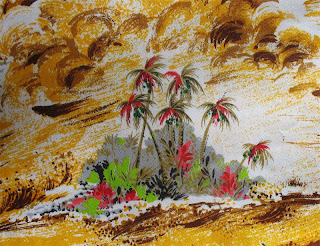 In the 60s my oldest brother had a silk shirt printed with rolling surf, palm trees and dusky maidens, and I thought it was sooo elegant. I was 6 years old! What did I know? I badgered my family for years to let me buy them Hawaiin shirts. They wouldn't, spoilsports. 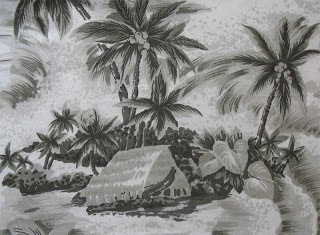 I have loads of fabric, in the most amazing colourways, of island-themed images. I have been collecting it for years, for something I call my Escape Quilt. 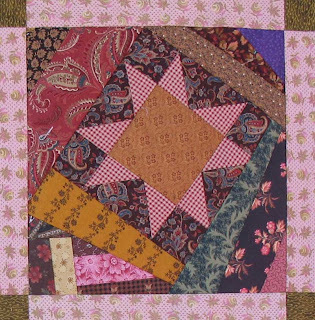 I imagine it will be a Ruth MacDowell type quilt, with a bit of patchwork and and a panel of scenery. I don't feel any pressure to actually make it just yet, I'm still collecting ideas and thoughts. It's not that I want to live on a tropical island; I've had enough of the tropics with it's humidity and bugs and endless summer. It's just the Idea of escaping, if you know what I mean, and being separated from the workaday life. Would you have to do dishes or vaccuum on a tropical island? I also loved those old Hollywood movies set on tropical islands, which is probably where I got all the imagery from in the first place. Of course they were in black and white, and I was pleased to find this monotone print at an op-shop. My Dad flew bombers in the Islands during the war, and his photos were fascinating to us kids. And I have all Thor Heyerdahl's books on his Pacific Island expeditions. Just don't ask me to go there! No sewing, no sleeping, much computer work being done. Nothing blogworthy to report. I haven't even unlocked the door to my sewing room in 5 days, that's dreadful! I will have to go down today and breathe fabric fumes for a while, to restore my equilibrium. My spare room is covered with stuff that I'm selling on Ebay, which is adding to the stress and confusion, but I think I have a system worked out and things are progressing. I have sold most of my vintage stash now, which might cause me a pang of suffering if not for the fact that I never used a bit of it. I was just the caretaker, and I decide d to let other enthusiasts enjoy the bounty. I'm awfully good at preserving things that need to be rescued, but then I never do anything with them, or I get snowed under with stuff. So I'm liberating myself. I used to visit op-shops a lot, picking up vintage fabric and laces and clothing. I had a marvellous hat collection, real monstrosities that women of my Mum's era considered essential for the well-bred woman. 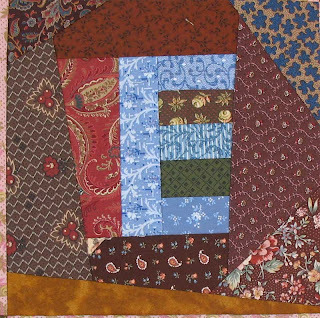 But when I sold my quilt cottage it all had to go. This pink crimplene one is the only one I kept; it's like a piece of sculpture! I keep repeating "I am not a Museum, I am NOT a Museum!" Ebay is the perfect solution. I rescue things of worth when I see them, and pass them on to people who are still in that acquisition phase. My most treasured vintage piece, that Ebay will neve r see? 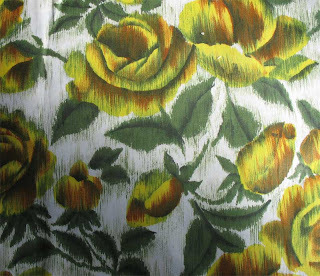 This rose fabric of Mum's, bought before the reality of having three children under 4 years of age dictated that there be no more sewing of her own clothes. I know the exact sort of dress she was planning, with a huge pleated skirt to show off her tiny waist, and a petticoat to make the skirt stand out even more. Maybe a couple of little buttoned tabs on the bodice for decoration, some little designer touch of the sort that she was so good at. 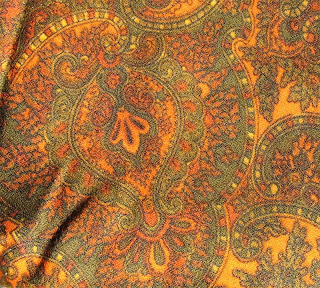 But it never happened, and I lusted after this fabric in her stash every time I saw it. She gave it to me about 15 years ago, and I still adore it. I finished my Single Irish Chain today, and it is now residing on the bed and looking wonderful. It's even bigger than the Red Elephant quilt, it took 10 binding strips and I've never had to use that many before. It took forever to stitch the binding on, I kept running upstairs to do some more work, then back down again to sew another side. I'm sure there were 5 sides on this thing, it was never-ending. But I'm so pleased with how it turned out, and it gives the room a new look. 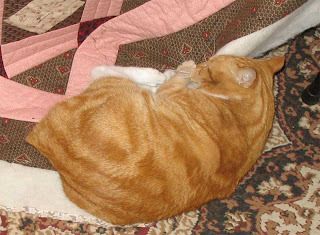 The Red Elephant quilt that normally lives on the bed will be folded on the quilt rack for a while, so it can have a rest. I think our bedroom looks rather nice now, can't think of anything else to add to it, except maybe to hang some pictures on the walls. If there were more space I would have a chair and a bookshelf so I could read in comfort; I don't like reading in bed for some reason. I also loathe the whole 'breakfast-in-bed' ritual, I don't think I have ever volunteered for that. If I'm awake then I want to be up and doing stuff, not balancing plates and coffee cups and dropping toast crumbs where I don't want them. I'm in a quilting mood, so I dragged out one of the projects I'm part-way through and spent a day marking the quilting lines for the next step. Of course I had help. I know I should be very cross with Bob for beating up on my quilt, but he's just so funny all I can do is pick up the camera and laugh. He's such a staid gentleman normally, it's hysterical to see Bad Bob in action. It's like watching a cart-horse gambol about in the paddock, very ponderous and unexpected. 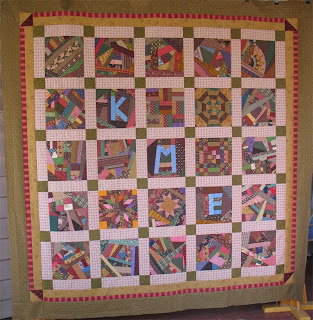 This quilt is Enormous, another huge one. I obviously went through a BIG phase, and I'm still dealing with finishing the monsters. 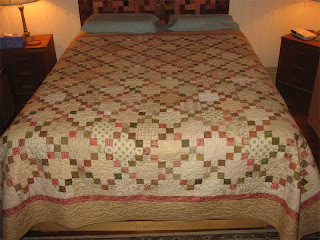 It does look nice on the bed though, and seeing as Wimbledon is coming up I may just hand quilt the blocks in this while I watch my tennis. Just a simple outline, and maybe a motif in the square. 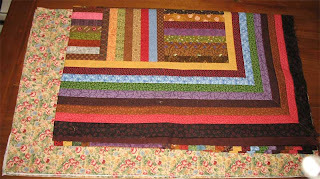 Only 61 blocks, wouldn't take long... All the blocks are already ditch-stitched, and the sashing quilted with double lines. 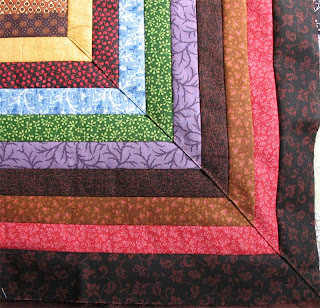 If I can get the borders quilted before then I would be happy, I could manhandle the thing in the hoop without any of the layers shifting then. It's definitely a Plan. Time keeps running away from me, and I just can't keep up! I have actually had some things to blog about lately, but simply no time to edit photos and post them. I seem to have caught up today though, and I'm going to get busy on some personal projects in amongst the work stuff. That's the plan anyway. I had 22 blocks of a Many Trips Around The World that I was making for our bed, and made the executive decision to make a smaller quilt instead. (Pattern by Bonnie, over at Quiltville...) One UFO finished, a small quilt completed, more time to move onto the next project; it made perfect sense. Still does. 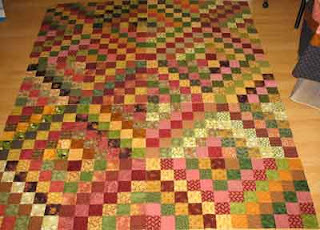 The colours are way off in the photo of the whole quilt, they are like the smaller photo. It's nice and rich and intense, and quite big enough for the spare bed thank you! And just to make this instructive, photos of how I do a mitred corner. 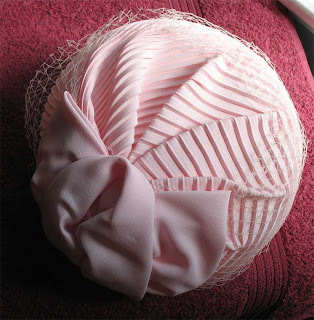 I use a folded mitre, not a seamed one. I don't bother to measure 45 degrees on the border strips, because if the pieced centre isn't a perfect 90 degree angle then the 45 degree mitre won't fit it anyway. 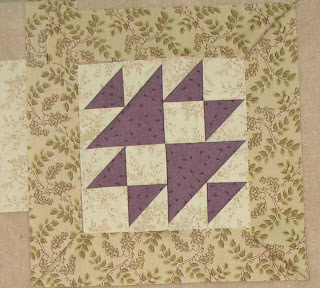 Often if you square the piecing up to 90 degrees you chop off points of triangles and lose seam allowances. None of which is necessary because all you need is a diagonal join, not a perfect 45 degree angle. 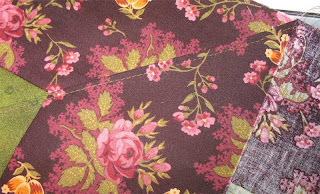 I sew my border strips on as usual, stopping the seam 1/4" away from the edge of the pieced top, so that I don't obstruct the seam allowance of the adjacent side. I back stitch for two or three stitches to secure the ends so that it won't come apart when I manipulate the strips in the next step. Then I lay the top on a large surface, like a table, padded with a towel, so I can iron on it. 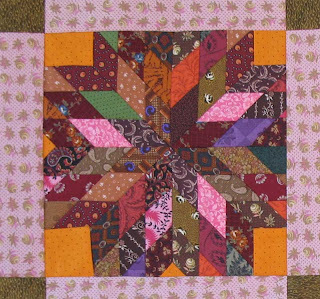 The surface needs to be large so you can lay out the top, one corner at a time, and make sure the corner is flat and the borders are laying right. I make sure the pieced area is perfectly flat on the table, then fold one strip back at an angle roughly how I want it. Then I make sure that both borders are not stretched out or bent in or anything. Once it's lying nicely I fine tune that fold, matching seam lines between the pieced section and the very edge of the border. A pin through all the important points will hold it in place while you gently give it a press with the iron. No moving the iron back and forth, or you will disturb the placement. Next I pin the layers together, with the pin heads facing towards the outer border. 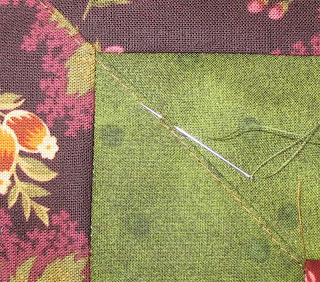 And then I run a tacking stitch along the folded edge using the machine set on a long stitch. 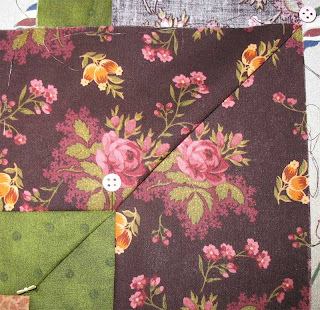 The final step is to slip-stitch the fold to the fabric underneath, keeping the stitches small and unobtrusive. I tend to use a normal applique stitch for this, and if I'm being fastidious I may even change thread colour for the different fabrics, but it would have to be a special quilt to make me do that. I usually choose a thread that will match most colours, and be extra careful to hide the stitches if the thread wants to show up. I trim the seam to about 3/8", remove the tacking thread and it's finished. Folding the mitre made short work of this heavily pieced border on my Roman Stripe quilt from last year. This would have been nasty to do as a seam, with all those seam allowances going the same way. 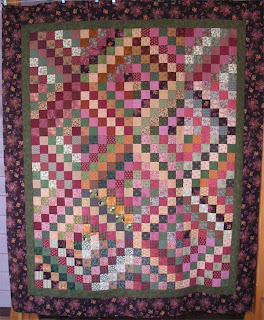 The whole quilt is in the post for September 23, 2006, if you want to see it again. I can't be bothered going to the extra effort of sewing this seam on the machine, getting it wrong, unpicking it, trying again etc. 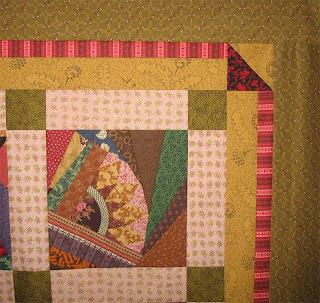 I do folded mitres on all my quilts, and if I didn't tell people, they'd mostly never pick it. 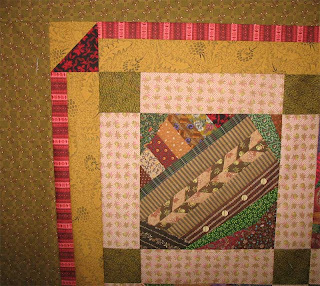 Last night I wanted to sew a small block just for fun, so I made a little Double X block. I loved how it turned out, and would like to make 20 of these blocks. They are 9" finished, and will have 1.5" sashing, so it will only be a small quilt. Knowing me it will probably grow into another monster, but it's a delicate little block so I'd be happy to leave it as a small wallhanging or lap quilt. With the magic of EQ6 I laid it out roughly how I want it to be, and put a few other blocks in there as well. I'm really liking the looks of this, it's rather formal and elegant. It will be quick and fun to do, and I think I will kit it up so that I can work on it when I get a spare day or two. "Hope this isn't received as nagging, but when you get some time, would you consider a post about how you kit-up a project? Would love to watch over your shoulder when you do this, and learn maybe some tips on this especially for a scrappy project. 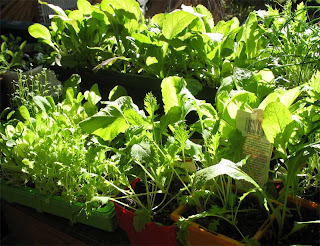 The hot weather coming up here in North America cries out for small and portable projects." I've never actually thought of this as a set process, because I kit different quilts in different ways. Most of my kits are somewhat controlled in colouring, because that makes it easier to plan and cut. Totally scrap would be a bit of a challenge unless I worked with generic size strips that I have already cut. I don't think I can do justice to this subject in a single post, so I will take photos as I kit up the Double X, and share my thoughts on the process as I go. I am not missing having the huge pile of scraps! I even went to the LQS and bought some new fabric, something I haven't done in a long time. It was very refreshing to see bolts of fabric, instead of shreds. The materials for the borders, sashes, corner-posts and future binding all came from deep stash. That's stash that's more than 4 years old. 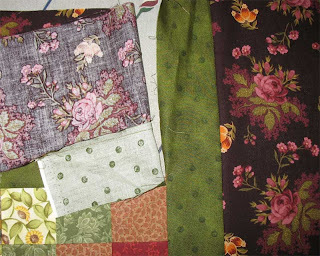 I wanted another fabric for the small pink border, but I only had a FQ, which is why I was at the LQS trying to match it. 'It's, oh, about 2 years old...' I told the assistant. No Luck. 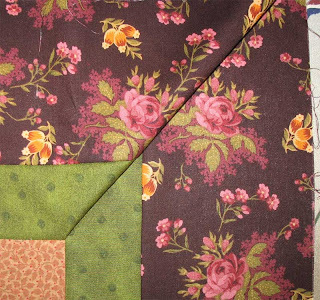 When I got home I looked through my fabric books, and found that I bought that FQ in Paducah, 5 years ago. Time does march on. My resolution not to make large quilts went out the window with this quilt. It fits the QS bed, and that's bigger than I intended but it just wanted to be like that. I am helpless in the face of such insistence. I just do what I'm told. 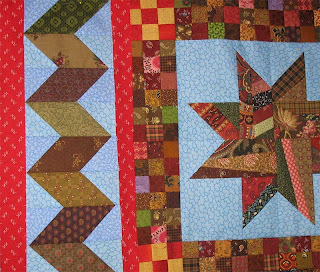 Several blocks, like the diamond star and the one to the right of the M block, are pieced with leftover strips from the 1" checkerboard of the Maverick Stars. I did get a bit desperate towards the end, when I needed three more crumby blocks and the pile of scraps was blechh and down to the dregs. That's when I raided the orphan block pile, and came up with the larger bits and pieces to use as the beginnings of a crumb block. They turned out to be my favourite blocks, that's always the way. The Initial blocks were just because I've never monogrammed a quilt before. If I had any sense I would have made a '7' block to date it to this year. I may applique that on one of the blocks still, wouldn't take a minute. And I made them blue because it is so out of character for me to be noticeable; I like to be wallpaper, in the background observing, quietly enjoying. I don't do the centre-stage thing happily, and I still feel uneasy at how noticeable these letters are. How bizarre! 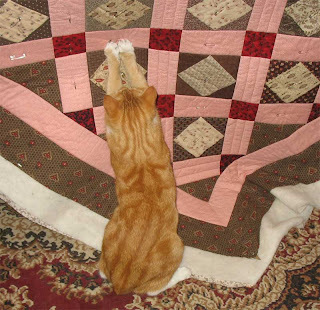 It's MY quilt! I need to get over that. I had another border planned, and it was just beautiful. Wrong border for this quilt though, so it's in the ideas basket and I will get round to developing it with another quilt. It was sooo pretty; it always amazes me that in the process of finishing one qu ilt I stumble across ideas for at least three more. That's why there will always be new quilts to make. What to start next! I think I may actually quilt something, and then there's a darling thing that Mereth is working on, and I could do some blocks for that to help out... I love this moment, when there's so much delicious choice of what to do next. Once the project is begun I get obsessed at seeing progress and work too hard, so I really enjoy the deep breath before it all starts again. 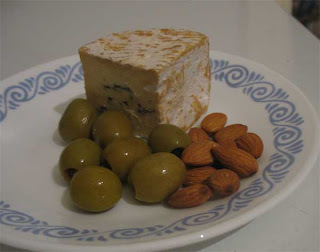 How slack of me, leaving a photo of cheese as the latest post on the blog for a week. I will have to try and do better than that this week. I do have pr ogress on my various projects to show, but I'm being stubborn and want to post the finished product, not the interim photos. So with a bit of effort today I should have one top finished and another well on the way. Let me just say I am sick of eeny-weeny scraps and want to chop up some Yardage! On the good side I have used up all my wodges and little bits, and now there are just strips left in the scrap drawers. That is a major achievement, seeing these scrap bins were full of snippets from 15 years of quilts. I hope I never accumulate that many again, it was overwhelming. I am going to pick a block, like Crosses and Losses, and make all my scraps into those blocks, not let them pile up in a mountain again. I am showing you two of my favourite blocks; more tomorrow. 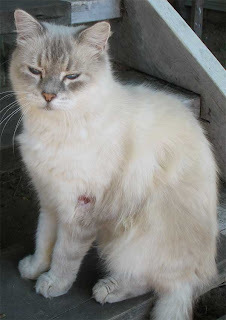 We have had drama with our Maxi-cat, who was attacked by a marauding stray tom. We took him to the vet to be patched up, and he's recovering nicely. If I had a gun I would happily shoot the stray, he's a vile creature. And I'm quite a good shot too, so I wouldn't miss the bugger. Bob is our official Care-Cat; whenever one of the others is sick or in trouble Bob comes to tell us, and then sits close to the afflicted one, being a good friend. 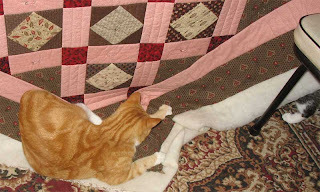 I've never seen a cat do that before; he and Max don't always get on, but whenever Max is unwell Bob will be right there next to him. We adore Bob! I hope I can do a lot of sewing and get all my work stuff up to date in the next few days, seeing as I can stay up all night if I want to. If I can! I don't know if I can do the all-night thing these days, but I'll give it a try.